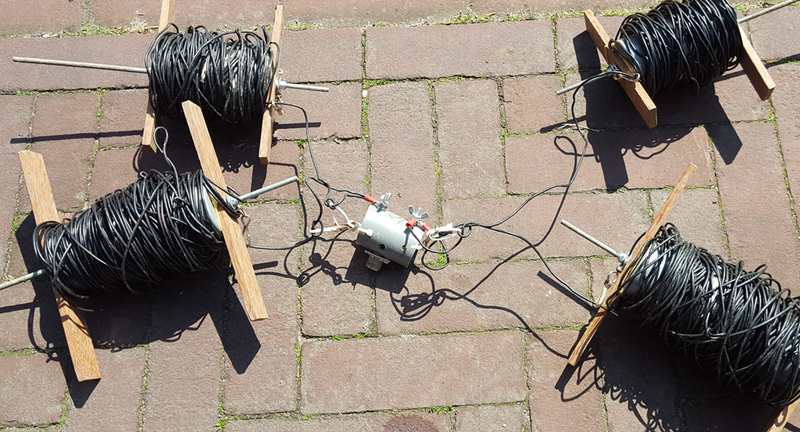 As I wrote before I now have a working 4m set-up using the 4m transverter kit from DF2FQ (XV4-40). I also have a compact 2/4/6 meter beam that I will describe in more detail in a future post. Although the beam is compact, I cannot use it at home as it is too large. How can that be? Well, I don't have a fixed mast - all my antennas start from my attic. I use a 20 meters long sloping end fed wire from my attic into the garden in an L shape for 80m-10m (resonant on 40/20/10m - works OK for 40-30-20). 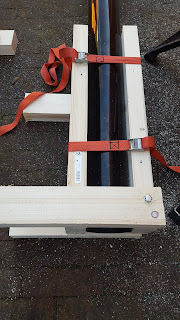 For 6m I use a vertical end fed wire that I put on a fiberglass pole in the attic and then push up through an attic window (I sometimes use this construction for lower bands as well). 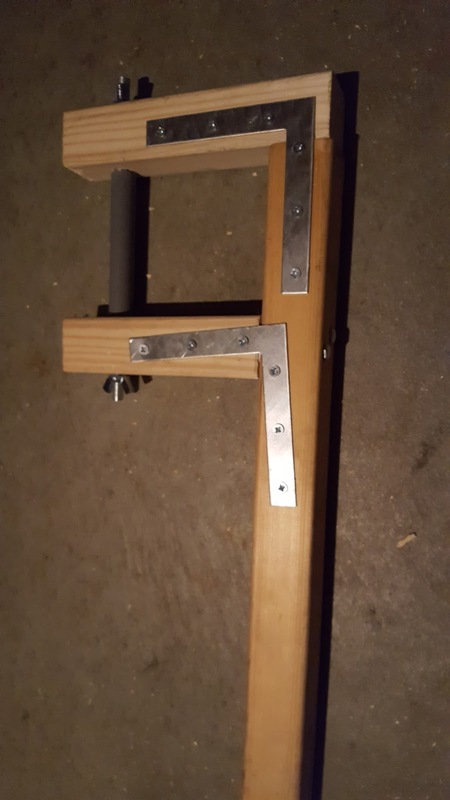 For 2m I have a compact 4 element beam that I can just push through the same attic window. 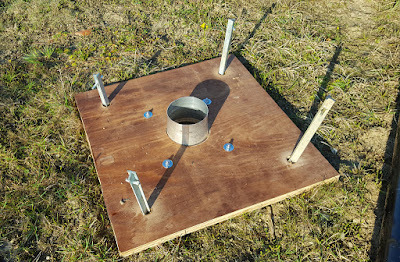 I attach that one to an aluminium push up mast. The 2/4/6m beam is just too large to fit through the attic window. So for working Es - one of my favourite sub hobbies - I needed a solution for 4m (having 6m and 2m covered). With Es you can get good results even with a "simple" vertical - as I have already experienced using my end fed wire for 6m. So, it was time to create a 4m vertical. Using a bit of ladder line PG8M had lying around and a nice online calculator by M0UKD (with construction tips), I created a slim jim for 4m. The online calculator and all the other info on John's page give you a good starting point but then you are tasked with finding the exact feed point position. 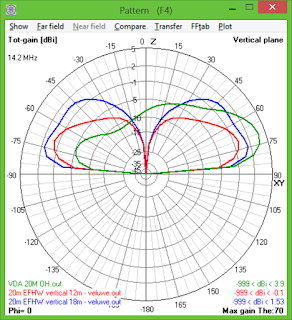 As John M0UKD notes, it is important to perform the final tuning in a set-up that resembles your target situation. 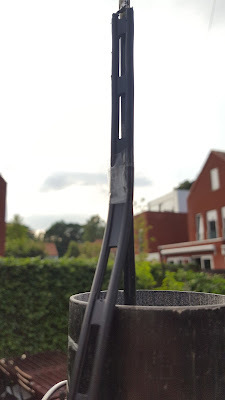 I stuck the ladder line to my fiberglass pole in the garden and pushed that up a couple of meters to make sure the antenna was away from obstacles (as I will be using it when I push it out from my attic). 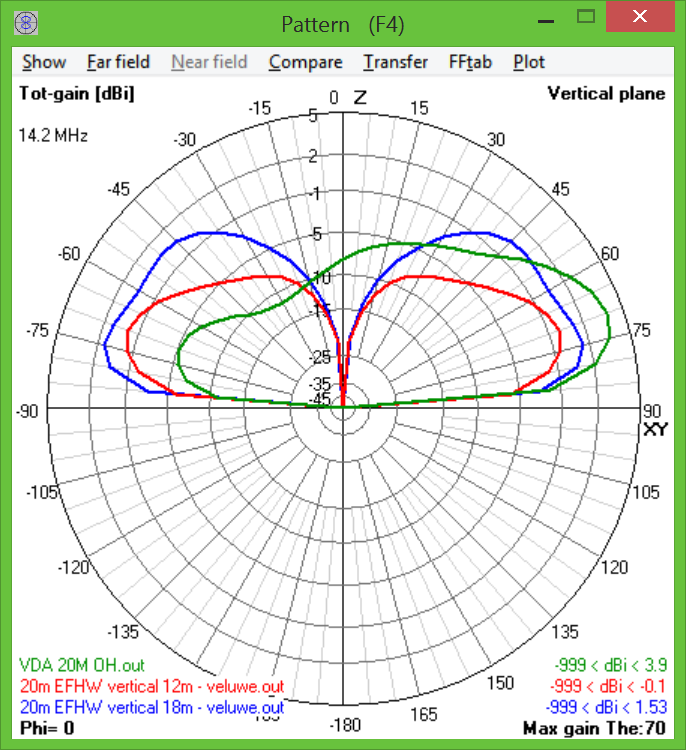 I tried different feed point positions, each time making measurements with my VNA. 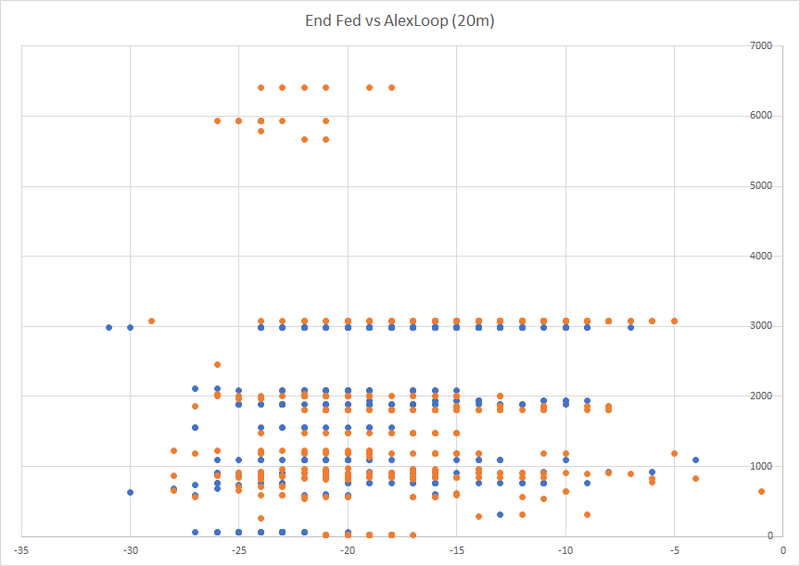 Finding the feed point position is a trial and error process. This is slightly complicated by the wires being insulated. 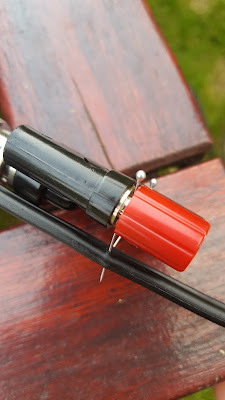 I didn't like the idea of having to remove the insulation on a large stretch to find the right spot, so I used the set-up in the picture above: two needles connected to my VNA. 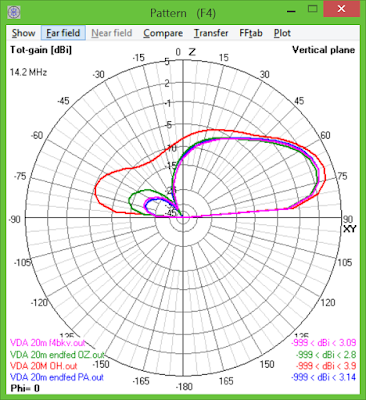 That way I could try different points and check the effect on the antenna SWR curve. 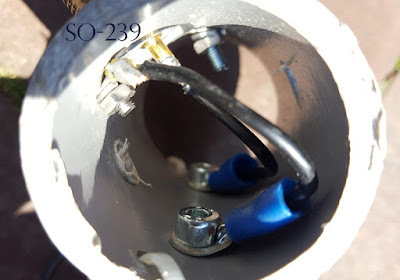 Finally I added a W2DU style current choke on approx 1m of coax (soldered to the feed point) that conveniently terminates with a SO-239 connector: ready to go. 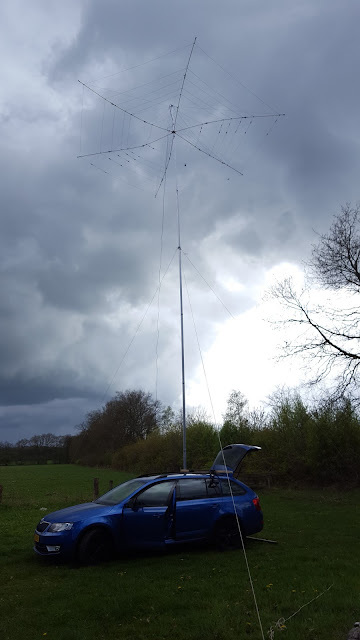 The end result gives me an antenna with an SWR of 1:1.6 on 70.200. I might improve that a bit more by tweaking the stub length in the future but as it is I am pleased to know I am ready for next year's Es season. 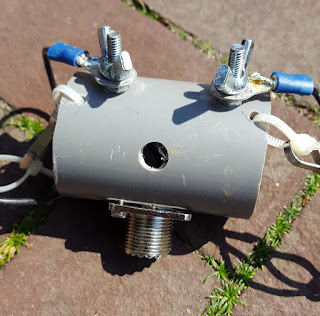 Almost a year ago I bought a 4m transverter kit from DF2FQ (XV4-40). I have basic understanding of electronics, acquired in part through the hobby but building a project like this was new to me. With my mechanical engineering background I am more confident in building robust stuff like antennas, masts, supports, baluns, etc. Soldering loads of tiny components on a board seemed challenging. 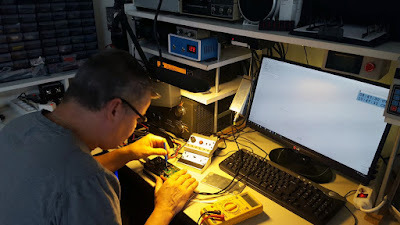 However the level of documentation provided by DF2FQ and some motivating words by PG8M - who was already using the transverter - pushed me to the point that I ordered the kit. When I received the package I must admit it looked daunting. I started building the kit sometime in August last year. 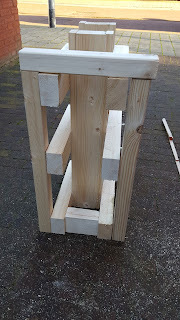 I tried to work as meticulous as I could (a challenge when you are as impatient as I am). When I had completed the kit and ran the first tests, I found that I received 70 Mhz signals with the radio tuned to 29Mhz. Hurray! However, when I tried to transmit, the transverter appeared to be dead as a dodo. No LED, no signal. A very disappointing result. I did some tests (as far my knowledge goes) and could not find the cause of the failure. So the kit went back in the box it was shipped in. Time for other projects. The Es season is rather good this year and I have enjoyed the effects on 6m but 4m was open a lot of times as well. 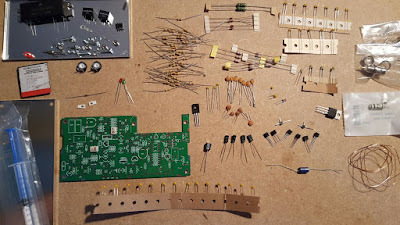 I really had to get back to the abandoned transverter project. PG8M had already kindly offered to help me months ago and today I took him up on his offer. We went through the error checking process step by step, finding and fixing four major issues. It turned out I had made two soldering errors and two of the smd resistors were faulty. 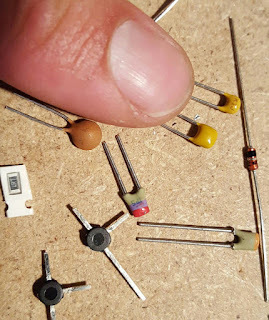 Whatever happened to these resistors I really don't know. 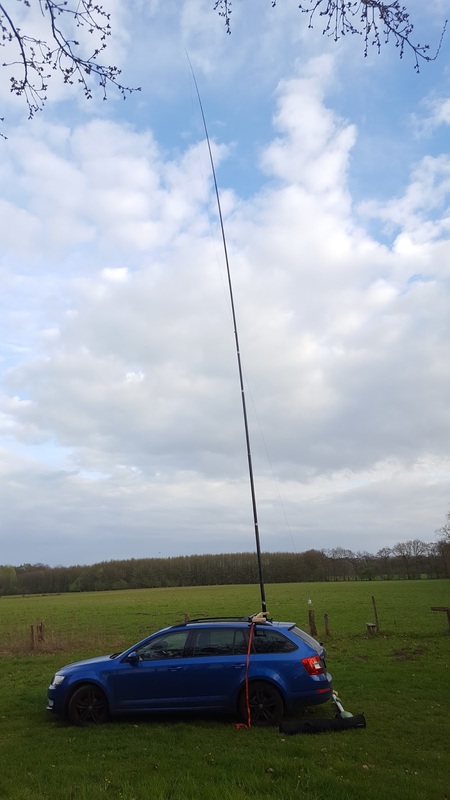 The good news is that we ended up with a transverter that delivered up to 35W on 4m with 5W drive on 10m. 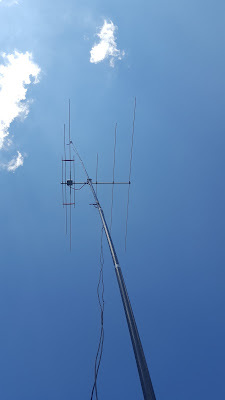 There was no one around to do an on air test so back home I hooked up the transverter and put my tri-band yagi on a pole @2m high in the garden. PG8M was QRV 30km away with his 4 ele beam pointing in my direction. That is when I made my first 4m QSO. It is a bit late in the Es season but I am sure I will get back to this band in the future. 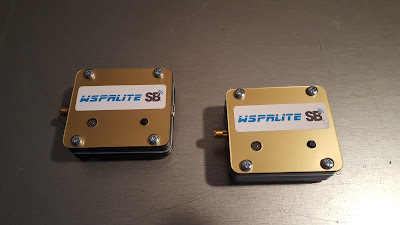 The next thing I need is an antenna I can set up quickly at home in case of any high MUF situations. 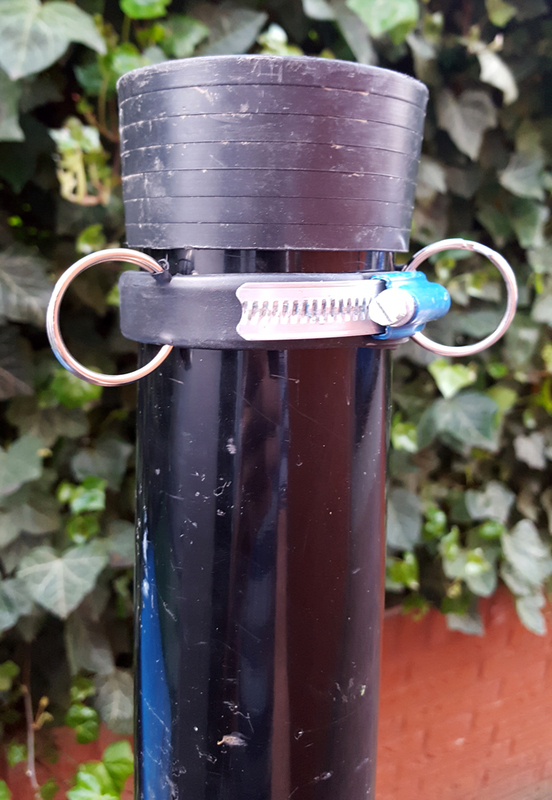 For 6m I use an end fed wire that I can attach to a pole that I push through the attic window. For 4m I am going to try a slim jim vertical. More on that later. Fellow blogger and radio addict Bas, PE4BAS is on holiday. To keep his followers busy he created a little puzzle to solve: where am I? I am always in for solving puzzles.. so here goes. 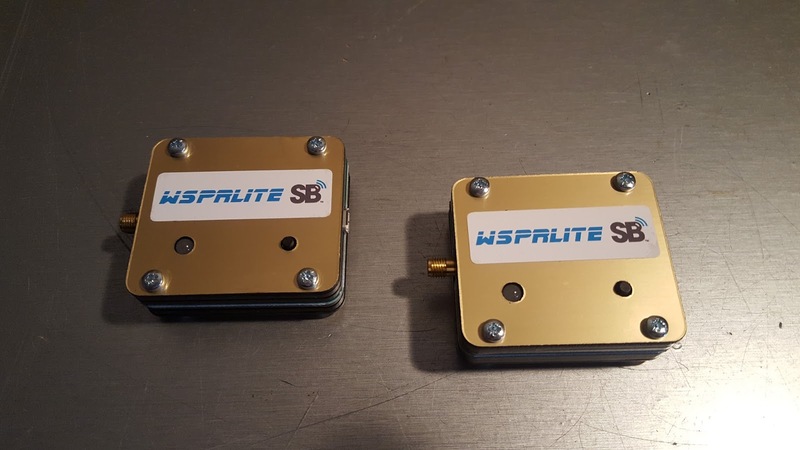 As he is a WSPR user (I think our first conversation was about visualising WSPR contacts), he can of course be found in the database. 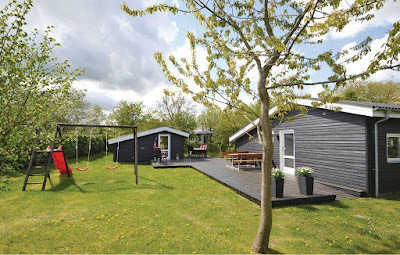 I had a look around (I hope Bas doesn't mind) and it indeed is a cosy place. I left him alone again to enjoy the rest of his holidays. Thanks for the puzzle Bas & have fun! Just got home from a nice activity at PAFF-0097 as PC44FF. I brought my hexbeam but the parking I had in mind when planning the activity was too crowded. Driving around I was lucky to find a nice open space to set it up. There were some rain and hail clouds around and I was just in time setting up the beam to stay dry. 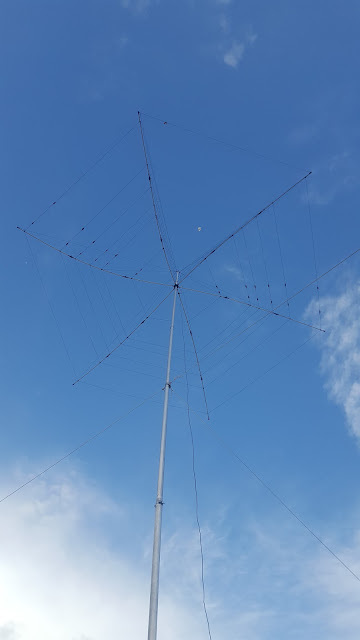 I started out on 20m with the hexbeam pointing to NA. The band was not in a very good shape so the going was slow but I did copy a lot of NA stations (relatively). I tried a sked with VK4FW but the band was just not good enough. After 2 hours mostly on 20m - I tried 17m but that was no fun - I had logged 106 QSOs. 36 of those were with NA stations from 14 US states and 3 VE provinces. Quite a lot of familiar NA chasers in the meantime. Personally I am OK with an activity once I reach 100 QSOs. However, as 20m was rather slow and I had not copied a lot of the familiar EU chasers, I decided to stay a little longer to try 40m. 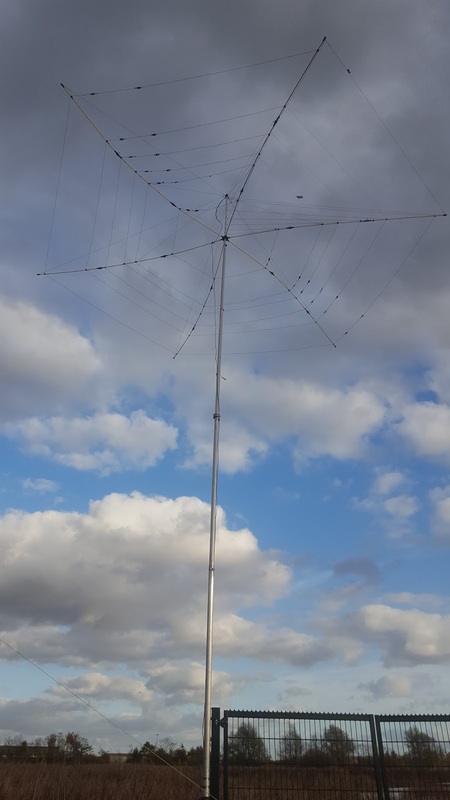 I took down the hexbeam and set up a 40m vertical (EFHW) on my 18m Spiderbeam pole. In about 45 minutes I was good to go again. 40m was very noisy where I was. 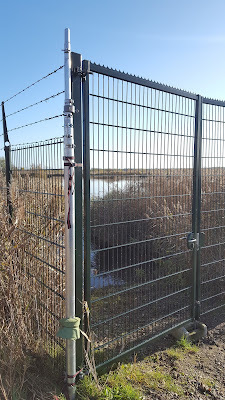 It was due to splatter (a combination of a good rx antenna and poor filters in my FT857d) but also QRN. I changed frequencies a few times but then decided I would have to just bear the noise. It was really busy though. As signals were rather strong I could copy a lot of stations above all the noise. As chasers kept on calling there was no way for me to leave. It was getting dark and far past my negotiated return time but you can't just ignore a pile-up of chasers (well, I can't). After 2 hours the pile up thinned and the signals dropped below the QRM level. 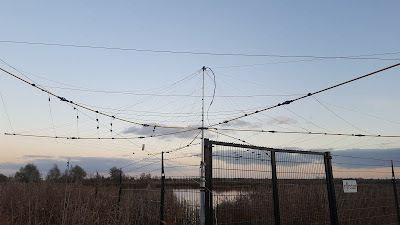 By then I had logged 238 QSOs on 40m - apart from 4Z and SU all of them EU chasers. This makes for a total of 344 QSOs for this activity with 6 park to park contacts. A lot more than I had anticipated. 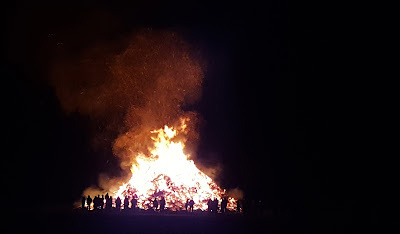 Driving home in the dark I saw a lot of huge bonfires and remembered that in this part of the country it is tradition to make large Easter fires. It made it a magical drive home with my ears still buzzing from all the noise. In preparation of our expedition to BS7 or P5 sometime in the future, YNOMY DX group has planned its first group expedition. So far we have all been active from various places outside of PA individually. 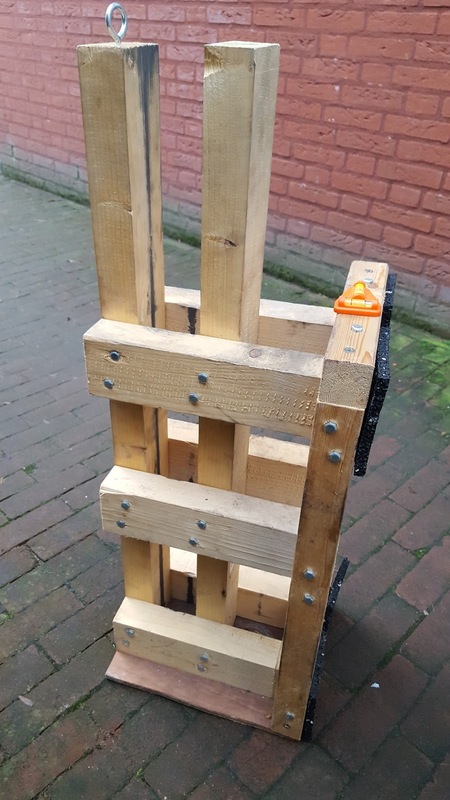 As a contest team we have shown to be able to work together for a couple of years already with rather acceptable results. So now we are off to our first team expedition on May 20 and 21. 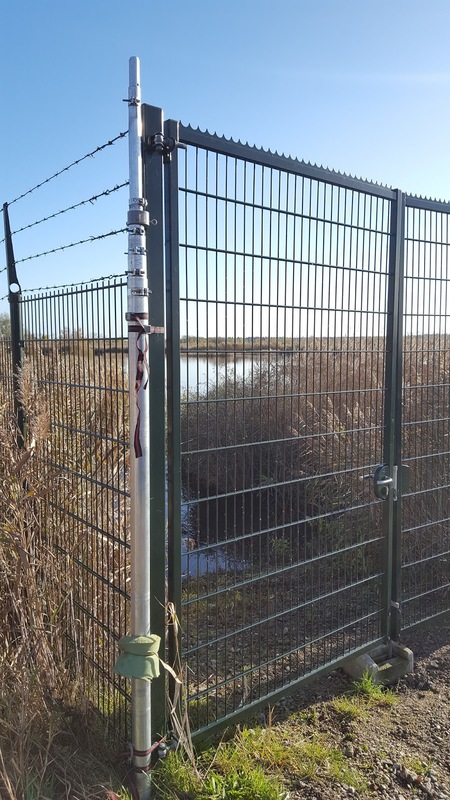 We chose LX as a convenient location and we chose WWFF as the focus of our operation. Working together with the LXFF coordinator, Mill LX1CC, we have made some draft plans and acquired a special callsign to be used for this expedition: LX44FF. Really looking forward to a whole weekend of LXFF. Let's hope conditions are acceptable or better. 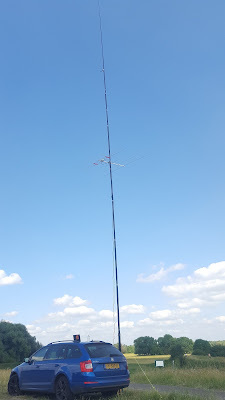 For my portable endeavors I have built an aluminum push up mast and I have bought various fiberglass poles from Spiderbeam. I actually started out with a 10m pole from Spieth. That was rather thin, so I went for the 12m HD version from Spiderbeam. 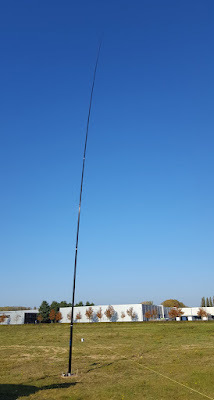 To get my inverted v's for the low bands up higher I then bought the 18m version and recently I went even further and got myself the tallest pole they sell - 26m. 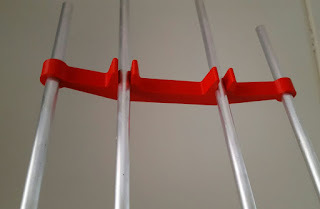 When I built the aluminum mast I went looking for a proper mast support that I could use with my car. Typically this would mean a drive-on support. 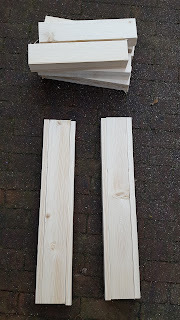 The ones I found on the internet however were too light for my sturdy (and heavy) mast. 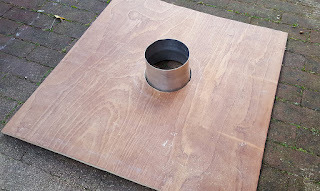 Not having any welding tools available to me at the time (I now have an arc welding machine), I decided to build something myself out of wood. 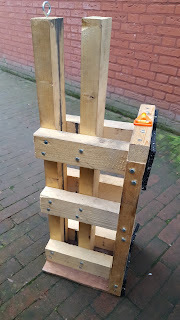 After some experimentation I went for a design where I attach the support to the wheel using lashing strap, instead of driving on the support. If you are reading this to try something yourself, keep in mind this design only works if you have spoke rims on your car. 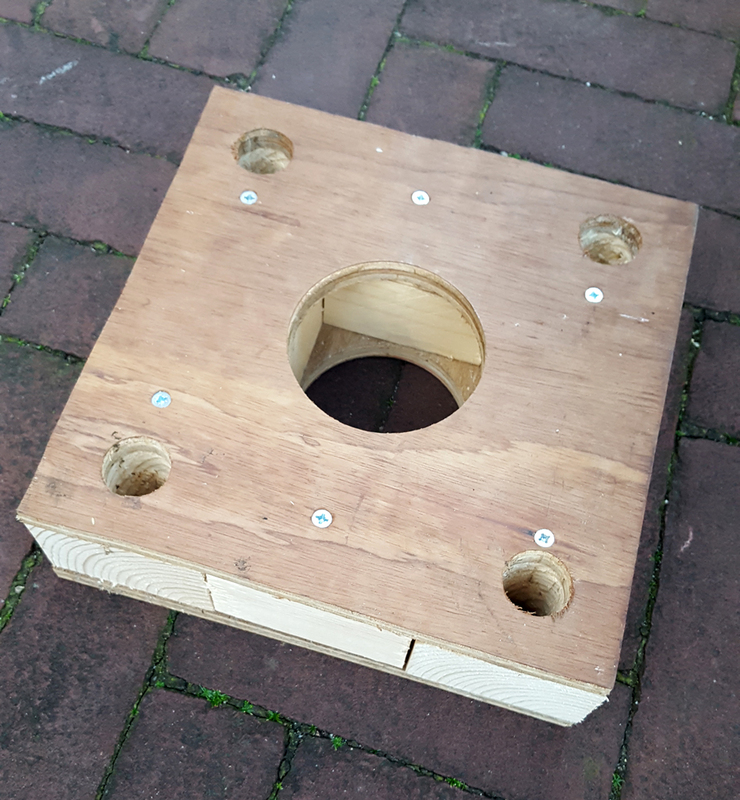 I never got around to write something about this support, even though I got questions about the design. 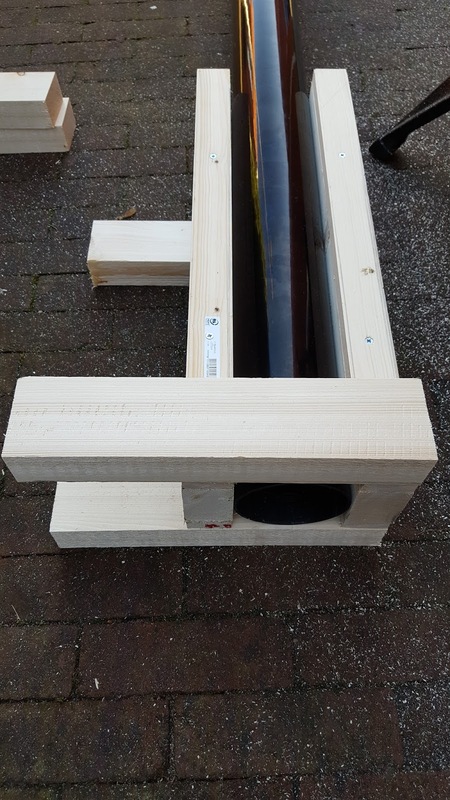 After buying the 26m pole I had to build a new support - for a much larger diameter mast - so I decided to take some pictures in the process. 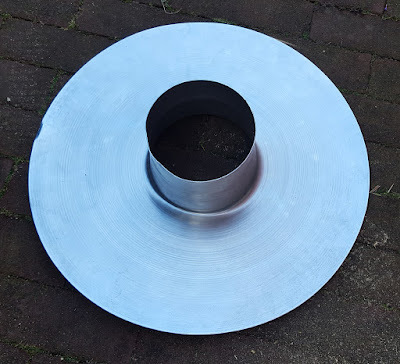 I constructed the old one for my aluminum mast that has a diameter of 70mm. 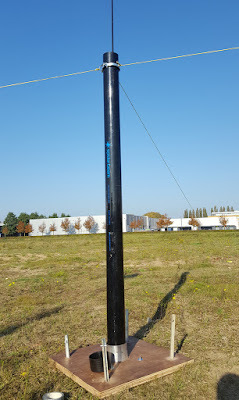 It can also hold the 18m Spiderbeam fiberglass pole. 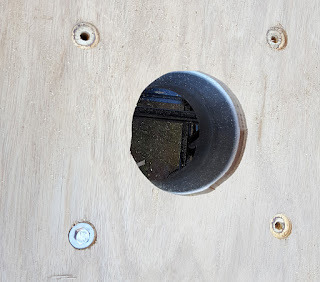 Conveniently the tall vertical wooden beams are the same width as the bottom segment of the mast. This means that the only spacing that is critical when you build it, is the spacing between the two vertical wooden beams. Now for the 26m I built the same support but I could not find wooden beams of the desired width, so I used the nearest (smaller) width and added planks to end up with the correct width - as you can see in the picture below. 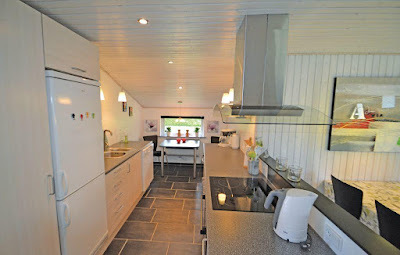 Now that the vertical beams are of the correct width, the only spacing you have to worry about is the one between the two vertical wooden beams. I used the bottom segment of the Spiderbeam pole to define the space, as shown below. 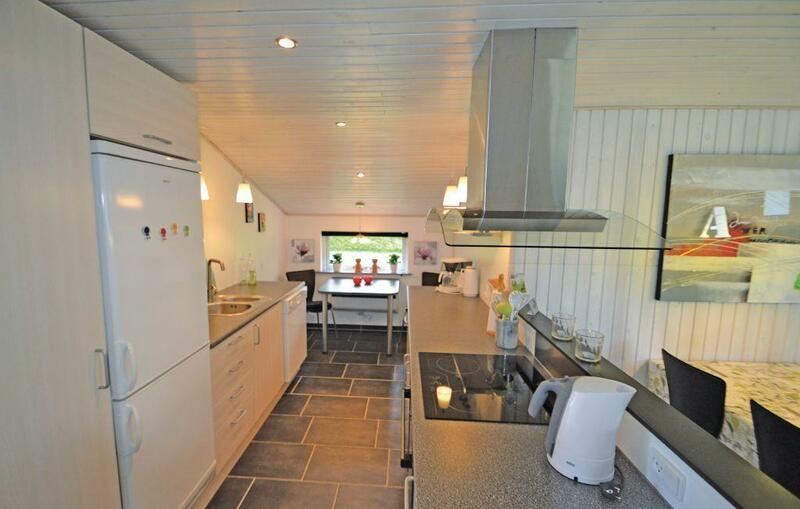 The length of the horizontal wooden beams is not critical. 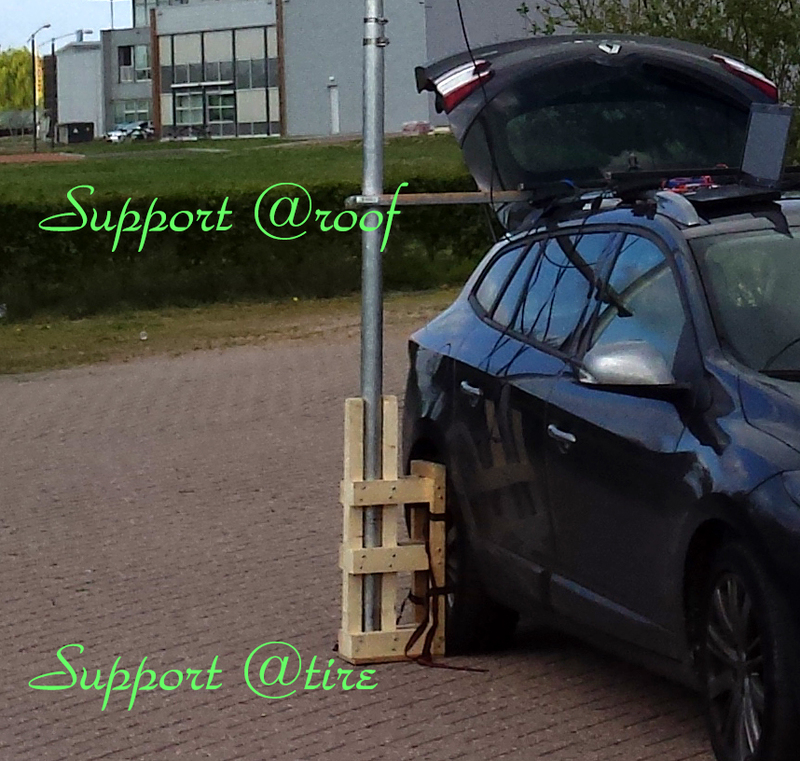 They define the space between the car tire and the mast / pole. 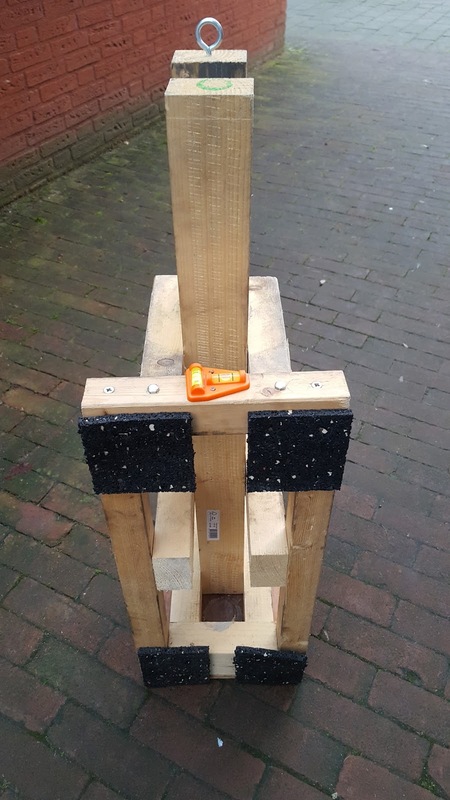 I use an extra 130 mm to leave enough room for my shoes - so that I can use the support to position myself higher when I push out the mast segments. 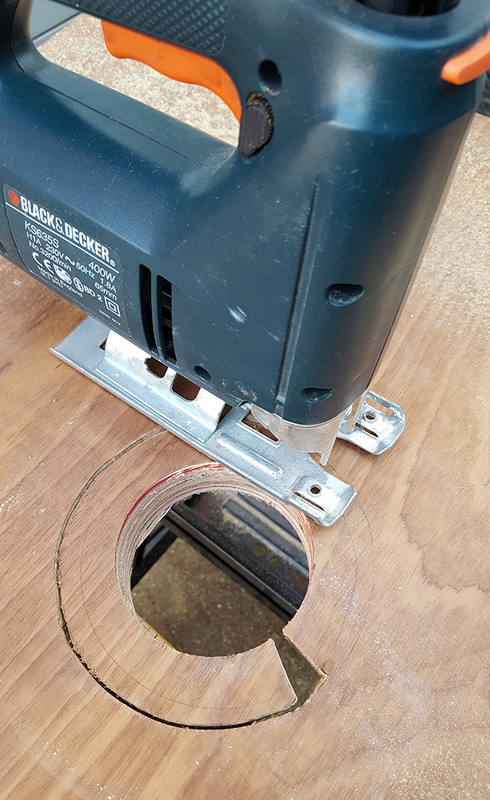 The height of the upper horizontal beam is critical in the sense that you need to make sure it stays within the height of the car tire (more about that later). What is left, is adding the frame that you can tie to your car rim. 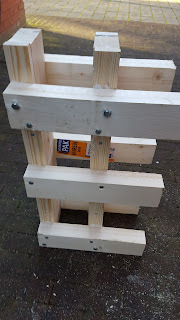 I use 44x44mm wooden beam for this frame. 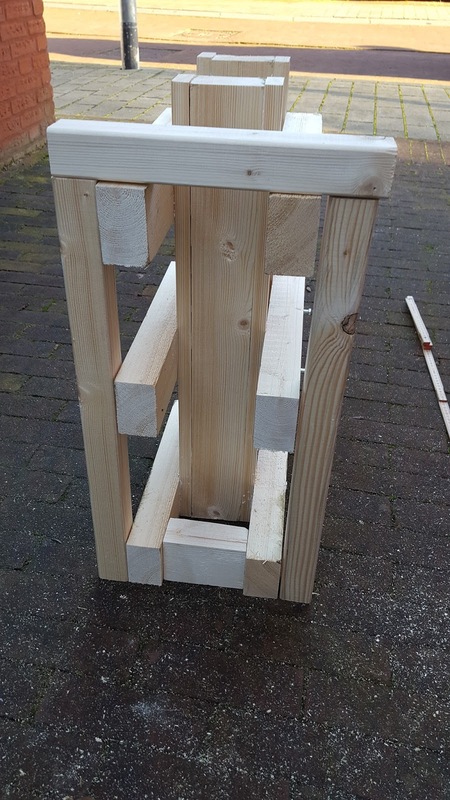 The height and width for this last rectangular frame have already been defined by the structure you have created so far. It is therefore important that the upper horizontal beam I referred to earlier, is positioned at a height that puts the top of the frame we are now going to add right against the rubber of your car tire. 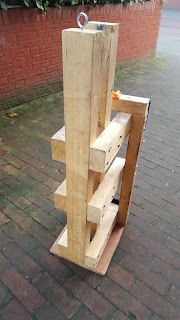 When I completed this stage I took two more steps: a piece of (ply)wood on the bottom of the support - this keeps the mast / pole from getting stuck in the ground (e.g. in case of a muddy underground). 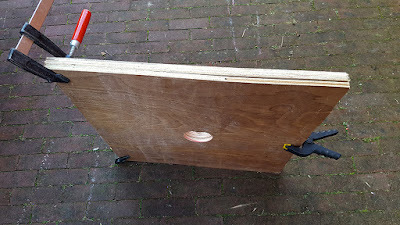 And I add pieces of rubber that go between the car tire and the wooden frame (refer to the pictures above of the old version). Now you have the lower support for your mast. This might be enough to keep your mast straight up. In my case I added a second support on the roof of the car. This helps keep the heavier masts (like my aluminum mast and the 26m Spiderbeam pole) straight up without guying. 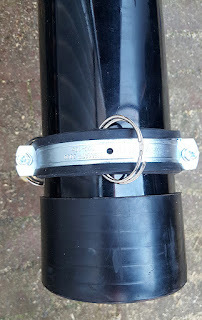 I use lashing strap to attach the support to a roof rack on my car.